Most Americans — and most Republicans — want stricter gun laws: Why doesn't it happen? As mass shootings have become increasingly common occurrences in the United States -- some conservatives claim they haven't, but that's clearly false -- supporters of stricter gun laws often blame the National Rifle Association for the fact that these horrific events never seem to lead to gun control legislation. Responding to the Wednesday killings at Marjory Stoneman Douglas High School in Parkland, Florida, NBC anchor Megyn Kelly was one of many media commentators who followed this script. Kelly expressed the sentiment that the NRA is the main reason why Congress can never pass any laws to restrict gun ownership -- and barely seems willing to consider them. "No gun reforms are getting through. They're not. And most of the ones that will be proposed in the wake of this shooting will be utterly meaningless and wouldn’t have even arguably prevented this killing," Kelly said on her Thursday program. "The NRA is too powerful. Our politicians are too weak. And the guns are too ubiquitous." Sen. Dianne Feinstein, D-Calif., is one of numerous prominent Democratic politicians who have expressed similar ideas. "Congress also has a problem — a debilitating fear of upsetting the gun lobby," she said in 2015, after a mass shooting in the Southern California city of San Bernardino. It's clearly true that the NRA is one of America's biggest and most prominent political interest groups. It has a lot of members, about 5 million by the group's count. It spent approximately $54 million across all federal races in 2016, without doubt a significant sum. But the NRA wasn't even close to being the biggest political spender of that electoral cycle. The network of donors controlled by right-wing billionaires Charles and David Koch spent an estimated $250 million from 2014 to 2016, and plans to exceed that sum in 2018 and 2020. On the other side of the ledger, liberal billionaire Tom Steyer donated more than $91 million to further Democratic candidates and causes, and continues to spend freely while promoting the potential impeachment President Trump. Indeed, if you scroll through the OpenSecrets.org list of political spending in 2016, it appears that rich liberals spent far more on campaigns than their conservative rivals. None of the many groups devoted to promoting stricter gun laws in America is anywhere near as large or well-funded as the NRA. But in fact the vociferous propaganda and deep pockets of the NRA are not the main reasons why America's gun laws are the way they are. While many politicians may well may fear attack ads from the NRA, such TV spots have not been proven to be effective. It's not the NRA that politicians fear most -- it's the rabid base of pro-gun voters that sustains it. Gun control is an issue that is remarkably similar to immigration, at least in political terms: People who feel most strongly about it are a minority, even among Republicans. But they care about it so much that they wield far greater political power than their modest numbers would naturally merit. A majority of Americans, including of Republicans, have supported stricter gun laws for some time. A survey conducted in October of last year by Morning Consult and Politico found that 88 percent of respondents backed the idea that all gun purchases should require a background check. Almost the same number, 84 percent, said that private gun sales (including those at gun shows) should also depend on a background check. A significant majority, 76 percent, supported a waiting period after a firearms purchase, and an identical proportion supported creating a national database of gun sales. Those numbers are especially remarkable when you consider that, according to a June 2017 Pew Research Center poll, 41 percent of Americans either own a gun or live with someone who does. 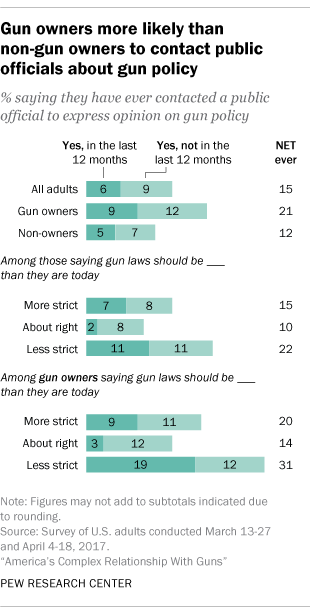 In other words, a significant proportion of gun owners appear to support increased regulations. Self-identified Republicans also support many proposed restrictions. In Pew's survey, 77 percent of Republican respondents favored background checks for gun sales at shows or for private transactions. An even larger number, 85 percent, supported not allowing people whose names appear on the federal "no fly" list to own guns. A majority of Pew's Republican respondents, 56 percent, also supported the creation of a national gun sales database, and 54 percent supported a federal ban on "assault weapons" (a term with no fixed legal definition). Most Americans clearly want tighter gun laws. Most Republicans appear to want tighter gun laws. But the minority of Americans who want virtually no restrictions on gun ownership get their way, over and over again, because they are more willing to act on their opinions. We know that thanks to two surveys Pew conducted in March and April of last year, which found that 22 percent of respondents who believed that gun laws should be less strict reported that they had contacted a public official to express that opinion. Only 15 percent of respondents who wanted more gun restrictions had ever done so. Pew also found that gun owners who wanted fewer gun restrictions were even more likely to be engaged with political leaders. According to its research, 31 percent of that group said they had expressed that opinion to an elected official, and 19 percent said that they had done so within the past year. Gun owners were almost three times as likely to make financial donations driven by the issue as non-owners. While 28 percent of gun owners said they'd given to a candidate or policy group focused on the issue, just 10 percent of non-owners reported doing so. In essence, while people who want more restrictive gun laws are clearly the American majority, they are not an effective majority. The determined and highly organized minority who are evidently willing to accept mass shootings -- as well as high rates of other firearms deaths, by murder, suicide or accident -- as the cost of unrestricted gun rights have dictated the national agenda on this issue. The NRA itself has not been immune to this phenomenon. In its original incarnation, the NRA was an organization for hunters and outdoorsmen, almost exclusively focused on firearms training and conservation. To the extent the early NRA held a position on gun control, it favored it. In fact, the NRA played a significant role in shaping the first federal law on the issue, the National Firearms Act of 1934, which required machine guns, silencers and sawed-off shotguns to be registered and taxed. The group's political position abruptly shifted after an internal coup in 1977, when more radical members voted out the NRA's leadership at its annual meeting in Cincinnati. The new leadership pivoted toward a "fundamentalist" interpretation of the Second Amendment -- which had never previously been understood to mean an unlimited right to own weapons of any kind -- and pushed back vigorously against almost any legal restrictions on gun ownership. In recent decades, the small minority of gun owners who want fewer restrictions (or none at all) has grown larger and more obstinate, not just thanks to inertia but also because the NRA now faces competition from the Gun Owners of America, a group that is far more extreme. With a radicalized membership beneath it and an even more extremist group eager to replace it, the NRA's leaders find themselves in a remarkably similar position to the national leaders of the Republican Party. Both must advocate for unpopular, illogical and morally indefensible policies that are nearly certain to be political losers in the long term. But both are now imprisoned, as in a modern-day Frankenstein legend, by the monsters they created for their own advancement.